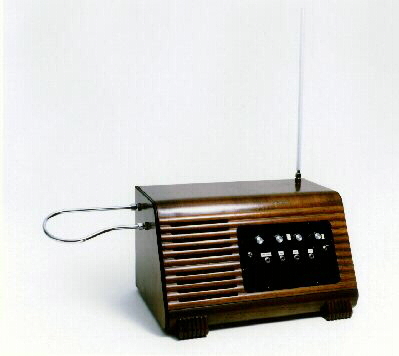 My personal "concert" model theremin is basically a Big Briar Etherwave™. However, I have made several additional features that to me, make it the best theremin I could have. First off, is the cabinet. It is a 1941 Philco radio cabinet. It measures 19" wide, 11" high (without the pitch antenna), and 13" deep at the base. The front of the cabinet slants at a traditional angle. The cabinet's inside dimensions are large enough to accommodate special features. The layout of the circuit board in relationship to the antennas and control knobs is nearly identical to the standard Etherwave™. My first task at hand was designing a control panel. With the old control panel removed (discarded), I was left with an area 9 3/4" by 6" which would be used to mount all the knobs, switches, and 1/4" plugs. I fashioned the new control panel out of black plexi-glass. The four pots were positioned in a similar manner as they are on the standard Etherwave™ model. Below the pots and knobs are four 1/4" jacks. From left to right, the jacks are: Pitch-Preview, Tuner-Out, Pedal (for activating Pitch-Preview and Tuner-Out), and Audio-Out. At far left on the control panel is the Power switch, and at far right, the Mute switch. Since theremins tend to be finicky creatures, I decided early on that my design would do best if I kept it near Etherwave™ specs. Keeping that in mind, I made a shelf of sorts to mount the pc board on. The distance from the circuit board to the top of the cabinet in my Philco is roughly the same distance found in the standard Etherwave™ cabinet. In other words, I mounted the shelf as near to the top of the Philco cabinet as possible. Antenna placement is similar to the Etherwave™ except that the angle of my volume antenna is a little greater than that of the standard model, and the pitch antenna is mounted on the top of the cabinet. For mounting the pitch antenna, I used the same kind of fitting used for mounting the volume antenna. Here's a pitch antenna hint. I find installing a short section of plastic tubing (3/8" ID) on the pitch antenna where the highest note is to be played very beneficial when it comes to performing. It will prevent that unwanted squealing if you happen to touch the pitch antenna while playing. It's very inexpensive, and available at most hardware stores. You can also cover the entire antenna for a more mellow sound, but that's an entirely different topic I'll cover some other time. The back panel (door) of my instrument mounts with screws and woodserts, and is birch cabinet-grade plywood. Mounted on it, is a 5-pin socket to which the standard Etherwave™ power source connects. An extension runs inside from it to the connection on the circuit board. It unplugs easily, and thus the door can be fully removed. The door is stained mahogany to match the cabinet, and also houses the main speaker. Inside the front of the cabinet is mounted a 6" dual cone, acoustic suspension speaker. Its magnet is 10 oz. The speaker mounted easily in place of the old radio speaker. In addition to it, is the main speaker, which is mounted on the rear panel. It is an 8" dual cone, acoustic suspension speaker, with a 10 oz. magnet. Balancing was accomplished by using a 25 watt, 15K Ohm resistor on the 6" speaker. The front speaker is used mainly as a reference speaker, not unlike using a speaker directly behind the performer's head, except in this case, the speaker faces the performer. It provides immediate aural feedback for the performer to quickly make the necessary adjustments for proper pitch. Yes, I had to re-tune both the volume response and pitch of the instrument. As bad as I thought the job would be, it really wasn't that hard to do. (After 4 or 5 times of doing it now, it's quite easy!) My instrument definitely benefitted from the re-tuning of both circuits. As a matter of fact, it is necessary if you house the Etherwave™ circuit board in a different cabinet. As for pitch circuit tuning, I'd like to point out that I had better results by doing the following procedure as opposed to the instructions that come with the Etherwave™. Instead of holding the pitch antenna, I find it best to keep the hand a distance of about one inch from the pitch antenna while adjusting L6. Set that position to the highest note, and things fall into place much easier. My instrument's highest note is "G" below "Super C", as we trumpet players like to call it. If you have time, you can benefit by going back and forth from adjusting L5 and L6. It can take quite some time to get things the way you want them. In my case, 1 1/2 hours. I had to remove, then replace, the back panel on my theremin for each tuning. It was time well spent. I wouldn't change a thing now! Eventually, you will find the proper tuning. I find my spacial response curve is improved, as the toe of the curve is less sharp at where it drops off. Makes for much smoother spacing, though the spacing does decrease as you approach the highest notes of the instrument. Still, that spacing is now considerably improved; the highest note is about 3/4" from the pitch antenna. Fairly easy to build by following the instructions in the customizing book that comes with the Etherwave™ kit. As nice as this feature seems it might be, I rarely use it. A tuner is not going to help you play in tune if you don't use your ear. The tuner feature is useful only when practising long tones, comparing beginning pitch to ending pitch, or finding a starting pitch without bringing the volume up. One thing that I must point out is that the left hand must be removed slightly from the volume antenna. If not, and the hand is left resting on the antenna, a note of a different pitch (lower) will register on the tuner, then as the hand is removed, the note sounding will be higher in pitch. This happens mostly in the mid and low registers. The use of a tuner is more helpful in practicing than it is in actual performance. I find this feature quite helpful in many aspects of theremin practice and performance. By using the "Tuner-Out" circuit, and replacing resistor R4 with a value of 47 K, the output of the circuit is then loud enough to be heard when using a small speaker, or earphone. The schematic is on page 12 of "Understanding, Customizing, and Hot-rodding your ETHERWAVE", Figure 7. The use of this feature is done much in the same manner of the traditional practice of "previewing" the pitch before bringing up the sound. A foot pedal controls this feature,and I guess someone more electronically inclined than me (hey, Jason...) could design a pedal that could vary the loudness of the effect in either the earphone, or small speaker. I've used this feature alot when recording, and its use when performing is helpful to find the starting pitch while (hopefully) an introduction is being played. I came up with this idea to have a pitch-preview function, and Bob Moog was nice enough to call me up on the phone and tell me how to go about modifying the Tuner-Out circuit. Another reason I think Big Briar is the best company on the scene. As mentioned above, the pedal is used to control the Pitch-Preview circuit, as well as the Tuner-Out circuit, since they are in fact the same circuit. The higher output does not seem to have any ill effects on my Korg DT-1 tuner. Ever wish you could keep your theremin powered up, yet put it in "pause"? That's why I added this feature, and it is used more than any other feature I have incorporated on my theremin. I couldn't live without my Mute feature. I ran the Audio-Out path through a switch, so that when mounted upside down, "On" becomes "Mute", or "Off" in the up position. The final tuning and adjusting occured on September 22, 1996, 11 days after I purchased the cabinet. The most recent modification occured on April 4, 1997, as I installed the main speaker on the rear panel, and again, re-tuned the volume response, as well as the pitch circuit. I call my theremin, "Tvox". I also use that word as an abbreviation for "theremin". Comes from the word, "Thereminvox". Good luck with your theremin endeavors!